Applications that run in Azure Kubernetes Service (AKS) may need to store and retrieve data. For some application workloads, this data storage can use local, fast storage on the node that is no longer needed when the pods are deleted. Other application workloads may require storage that persists on more regular data volumes within the Azure platform. Multiple pods may need to share the same data volumes, or reattach data volumes if the pod is rescheduled on a different node. Finally, you may need to inject sensitive data or application configuration information into pods. Applications often need to be able to store and retrieve data. As Kubernetes typically treats individual pods as ephemeral, disposable resources, different approaches are available for applications to use and persist data as necessary. A volume represents a way to store, retrieve, and persist data across pods and through the application lifecycle. Azure Disks can be used to create a Kubernetes DataDisk resource. Disks can use Azure Premium storage, backed by high-performance SSDs, or Azure Standard storage, backed by regular HDDs. For most production and development workloads, use Premium storage. Azure Disks are mounted as ReadWriteOnce, so are only available to a single node. For storage volumes that can be accessed by multiple nodes simultaneously, use Azure Files. Azure Files can be used to mount an SMB 3.0 share backed by an Azure Storage account to pods. Files let you share data across multiple nodes and pods. Currently, Files can only use Azure Standard storage backed by regular HDDs. emptyDir - This volume is commonly used as temporary space for a pod. All containers within a pod can access the data on the volume. Data written to this volume type persists only for the lifespan of the pod - when the pod is deleted, the volume is deleted. This volume typically uses the underlying local node disk storage, though can also exist only in the node's memory. secret - This volume is used to inject sensitive data into pods, such as passwords. You first create a Secret using the Kubernetes API. When you define your pod or deployment, a specific Secret can be requested. Secrets are only provided to nodes that have a scheduled pod that requires it, and the Secret is stored in tmpfs, not written to disk. When the last pod on a node that requires a Secret is deleted, the Secret is deleted from the node's tmpfs. Secrets are stored within a given namespace and can only be accessed by pods within the same namespace. configMap - This volume type is used to inject key-value pair properties into pods, such as application configuration information. Rather than defining application configuration information within a container image, you can define it as a Kubernetes resource that can be easily updated and applied to new instances of pods as they are deployed. Like using a Secret, you first create a ConfigMap using the Kubernetes API. This ConfigMap can then be requested when you define a pod or deployment. ConfigMaps are stored within a given namespace and can only be accessed by pods within the same namespace. Volumes that are defined and created as part of the pod lifecycle only exist until the pod is deleted. Pods often expect their storage to remain if a pod is rescheduled on a different host during a maintenance event, especially in StatefulSets. 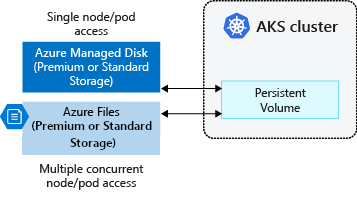 A persistent volume (PV) is a storage resource created and managed by the Kubernetes API that can exist beyond the lifetime of an individual pod. Azure Disks or Files are used to provide the PersistentVolume. As noted in the previous section on Volumes, the choice of Disks or Files is often determined by the need for concurrent access to the data or the performance tier. A PersistentVolume can be statically created by a cluster administrator, or dynamically created by the Kubernetes API server. If a pod is scheduled and requests storage that is not currently available, Kubernetes can create the underlying Azure Disk or Files storage and attach it to the pod. Dynamic provisioning uses a StorageClass to identify what type of Azure storage needs to be created. To define different tiers of storage, such as Premium and Standard, you can create a StorageClass. The StorageClass also defines the reclaimPolicy. This reclaimPolicy controls the behavior of the underlying Azure storage resource when the pod is deleted and the persistent volume may no longer be required. The underlying storage resource can be deleted, or retained for use with a future pod. default - Uses Azure Standard storage to create a Managed Disk. The reclaim policy indicates that the underlying Azure Disk is deleted when the pod that used it is deleted. managed-premium - Uses Azure Premium storage to create Managed Disk. The reclaim policy again indicates that the underlying Azure Disk is deleted when the pod that used it is deleted. A PersistentVolumeClaim requests either Disk or File storage of a particular StorageClass, access mode, and size. 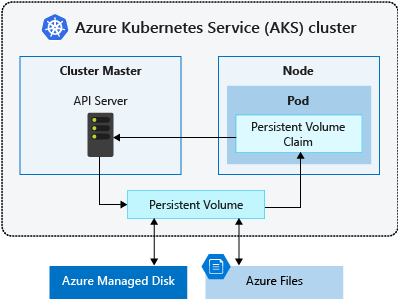 The Kubernetes API server can dynamically provision the underlying storage resource in Azure if there is no existing resource to fulfill the claim based on the defined StorageClass. The pod definition includes the volume mount once the volume has been connected to the pod. A PersistentVolume is bound to a PersistentVolumeClaim once an available storage resource has been assigned to the pod requesting it. There is a 1:1 mapping of persistent volumes to claims.